When Bill and Meta Juhnke became full-time small family farmers in 1967, they were 55 and 51 years old. Their move to full-time farming was against the grain of American social and economic history. For most rural folk, this was an era of flight from the farm, rather than return to the farm. New agricultural technologies, specialization, and economies of scale on large corporate operations drove millions of small farmers to towns and cities. In the forty-six plus years that Bill and Meta operated their farm (1938 to 1984+) the number of US farm residents declined from 30.5 million to 6.1 million. In those same years, the average size of farms in Kansas more than doubled in size, from 300 to 650 acres. Bill and Meta's farm was 330 acres of non-irrigated land. Map dated 1980, with Bill & Meta's land marked in blue. The price of wheat, which had been over two dollars per bushel for seven years in the early fifties, fell to unprofitable levels between 1964 and 1971. Shortly before wheat harvest in May 1967, Clarence Schrag, Bill's friend from the Eden Church, recruited him to join the McPherson County branch of the National Farmers Organization (NFO). With the price of wheat down to $1.19 in Elyria, the situation required more than, as Bill wrote, "to simply have faith in better days for the farmer." The NFO was a populist agrarian movement that gained a radical reputation from its "holding actions" to withhold food products, such as milk, from the market until prices went up or the food spoiled. Bill joined with other NFO members who negotiated collective contracts for the sale of wheat outside of the conventional market system that left individual farmers totally vulnerable. In 1973 the price of wheat spiked upward after the Soviet Union made an unprecedented purchase of grain. For several years farm incomes escalated and the NFO declined, even though rampant inflation increased farm expenses. Bill served as secretary of the Kansas Fourth District (five counties) NFO Convention in August, 1973, in Newton, Kansas. That apparently was the district's last NFO meeting. Bill and Meta were fortunate that their farm land was substantially paid for. In July 1968 they purchased a small house in North Newton that Meta's mother had lived in as a widow--perhaps anticipating that Meta might face similar widowhood in the future. Then she might have a place to live just a block from Jim and Anna's house in North Newton. Bill and Meta did not carry the large load of debt that drove so many overcapitalized farmers into bankruptcy when the grain price bubble burst in 1976 and 1977. 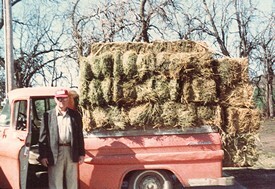 Bill was able to purchase needed farm machinery at a manageable pace. In 1972 he bought a new Allis Chalmers 180 diesel tractor to supplement the older 1961 John Deere 3010 diesel tractor. The old Farmall H was still usable for small jobs, for loading manure, etc. 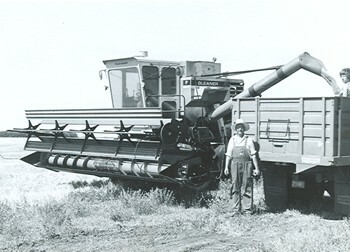 In 1975 Bill bought a new Gleaner combine with an eighteen foot header-perhaps the most underused machine on the farm. Bill did some custom combining for neighbors, but not enough to make a big difference in his bank balance. Their biggest investment in these years was a modern new house. In 1980 Bill contracted with his nephew, Keith Juhnke, to build a house that Meta had for decades yearned and agitated for. 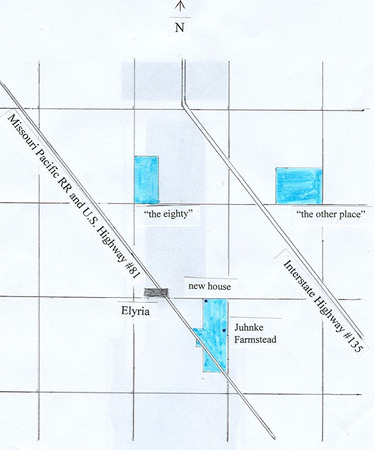 The new house was located near Elyria on the northwest corner of Juhnke farm land. In November 1980 they moved from the old farm house to the new house at Elyria. Bill Juhnke with Gleaner combine unloading wheat. With the help of the government Soil Conservation Service (CSC), Bill in the 1960s implemented a program to contain soil erosion and improve soil quality. Over a seven-year period he constructed terraces, developed waterways, began cultivating on the contour, and systematically planted legumes to improve soil fertility. In 1967 the McPherson County Conservation Service brought a bus tour group to the Juhnke farm. In his presentation to the group, Bill said that his own father, Ernest Juhnke, with all due respect, had been "mining the soil." Bill now wanted to turn over the land to the next generation in better condition than he had received it. He showed the group the booklets of soil maps and plans that the Conservation Service had provided for his farm. He said, "The idea is that each acre has certain needs for conserving practices and uses. The purpose is not only to hold water as it is now falling on the land and to hold the soil on the land, but actually to even improve the land through use of legumes, fertilizers, etc." On one field (the "120" a mile and a quarter north and a mile east of the home place), Bill had removed a half mile of Osage orange hedge and replaced part of it with a waterway of brome, bluestem and switchgrass. Bill preferred better tillage practices to control erosion rather than to maintain trees that took up space and sapped moisture. Bill also showed the tour group his new tool bar with different kinds of shovels, including chisels that could be used for deep tillage. As he wrote in a letter to his children, when the tour group departed, "The boss man said, 'Thanks Bill, you did an exceptionally fine job.'" In 1969 Bill was one of five McPherson County farmers to receive a Bankers Award for Outstanding Soil Conservation Work. The headline in the February 13 McPherson Sentinel said, "Former Teacher Puts His Soil Conservation Plans to Work." He had put in 6.7 acres of grassy waterways, built 1,293 feet of diversion terraces, and put in one grade stabilization structure. The article also reported that "Mrs. Juhnke helps with the farm work, such as driving the tractor while picking up bales of hay." A detailed agriculture census that Bill and Meta filled out in January 1970, recording farm operations for the previous year, gave a snapshot of the extent and diversity of their farm operation. The farm included 330 acres, valued at $250 per acre. They had harvested four crops in 1969: wheat, sorghum (milo), soybeans and alfalfa. Wheat was dominant, with 162 fertilized acres and a yield of 4,050 bushels. Fifty acres were in sorghum, with 2,000 bushels harvested. Ten acres were in soybeans, with 260 bushels harvested. And thirty acres were in alfalfa, with 100 tons of hay harvested plus three acres harvested for seventy-five pounds of alfalfa seed. Livestock on the Juhnke farm included twenty nine cattle, including two milk cows. Thirty cattle had been sold in 1969. There were eight chickens and two hogs. Four hogs had been sold that year. Bill and Meta had paid only thirty-two dollars for commercial feed for the livestock. They were raising their own feed. They were eating eggs, meat, milk products and garden produce that they had grown on the farm. Another measure of their self-sufficiency was that they had paid only $270 for farm labor in 1969. It is possible that some of that money went to their own children. Juhnke farm income in 1969, in addition to sale of grains and alfalfa, included $2,515 from government farm subsidies, and $500 for custom combining. Total farm income was $6,820 more than total expenses. This was clearly a viable farm operation, even if it was not going to make Bill and Meta wealthy. There surely were fluctuations from year to year in the 1970s and 1980s, depending upon the weather and volatile grain prices. But this remained, as long as Bill's health allowed, a diversified family farm, focused mainly on wheat production. It represented a level of independence and self-sufficiency that were becoming increasingly rare on the American agriculture scene. If Bill and Meta Juhnke were distressed or depressed about the bleak prospect of the small family farm in general, they did not talk or write about it. To be sure, they complained about low wheat prices and expensive equipment. But they loved their life on the farm and they held onto it as long as their health allowed. When they reached their sixty-fifth birthday they were eligible for Social Security payments and, for Bill, teacher retirement payments. Not only did Bill have a kind of mystical attachment to the land, he was also an incurable progressive who looked forward with optimism to the future. For him the cup was always half full, not half empty. Moreover, he was always convinced that progress toward realizing the kingdom of God on earth depended upon committed Christians who worked at the local level-in primary family, church and community contexts. In 1973, when challenged to write some lyrics for the centennial celebration of the Swiss-Volhynian migration to America, Bill offered some lines to counter the otherworldly emphasis of a proposed centennial hymn, "To God be the Glory." Bill's lyrics pointed forward to a greater future here "on earth." Jesus was to be seen "among us," rather than just far away in heaven. Bill suggested the following verse. on Earth in our hearts are some victories not won. the future among us as Jesus we see." "Football queen and opera star, Carita's quite a catch. She can bake a coffee cake and she can sew a patch. Bill's married to a Schweizer--that's puttin' on the style." Daughters Sharon and Ruth graduated from Moundridge High School in 1966 and 1968. Like their siblings, they made good grades, played musical instruments (alto saxophone and trombone respectively), participated in forensics and debate, and were active in church youth group activities. Sharon was Y-Teen president her senior year at Moundridge, as Janet had been at Lehigh. Sharon and Ruth both went on to Bethel College, where a spirit of student reform activism was flourishing, especially protests against the American war in Viet Nam. The failures of American foreign and domestic policies discredited the government and helped foster a counter-cultural youth movement that was alienated from traditional authorities and values in general. In 1969, her sophomore year at Bethel College, Ruth dropped out of school and moved away from home, as did tens of thousands of young people across the country in those years. After a time of travelling, Ruth found a new spiritual home in communal life with the Divine Light Mission, a rapidly growing religious movement led by a youthful guru from India, the Guru Maharaji. In 1979 she wrote to Jim and Anna, "It is a positive, beautiful, practically constructive path for me--I like it, I love it; it feels good; it feels right; it feels healing . . . . I know I must follow my heart--follow that pull to what I deeply and conscientiously know is true and is the source of love for me." Ruth lived in an ashram in Denver, and made a three week pilgrimage to India. She did not cut herself off from the Juhnke family, however. She kept in touch with her parents through letters and frequent visits back to the farm by Elyria. She saw the teachings of peace in that group as consistent with, even a fulfillment of, the Anabaptist-Mennonite tradition. Bill and Meta struggled to understand Ruth's new life. Meta worried that the Divine Light Mission was a "cult." She wrote to Ruth that she knew of parents who had kidnapped their children from the Divine Light Mission and had them "deprogrammed." But she said, "We have never seriously considered anything like that so don't worry." In January 1970 Bill Sr. wrote a long, and at times anguished ("Oh! To be WHOLE again! "), letter to his son, Bill Jr., about Ruth. Bill Sr. had long seen himself as a reform-minded liberal who supported positive change--even revolutionary change. Now, in the face of the new youth movement, "I get caught being a Redcoat. A paternalistic, Mennonite, establishment Redcoat." Bill Sr. got some help in reading a book that Janet had given him for Christmas in 1968, Growing Up Absurd, by Paul Goodman. In early 1971 Bill read the popular book by Charles A. Reich, The Greening of America. Reich acclaimed the rise, and alleged forthcoming triumph, of a new cultural consciousness that was transforming the country nonviolently and nonpolitically. He scorned an outdated liberal consciousness that sought change through "a massive effort at organizing: an effort directed at politics and law." Here Bill wrote in the margin, "N. F. O.," referring to his own role in the kind of interest group politics that Reich disparaged. As time passed, Bill and Meta's fears about Ruth were moderated. In October 1974 Bill wrote to the family that Ruth had reported there were fourteen Divine Light Mission ashrams in Denver. He was pleased that Ruth benefitted from a supportive community. He wondered if the group was undergoing a typical American process, akin to that outlined in a book he had read long ago, The Social Sources of Denominationalism by Richard Niebuhr. In the early 1980s Maharaji dissolved the Divine Light Mission organization and ashram system in America. Ruth moved to Kansas City and found employment as a law librarian and receptionist. She later reflected, "It was an adjustment for me going out into the 'world,' basically making my way on my own, after twelve years of group support. In one way, I had gone from a Mennonite cocoon to a group cocoon that was practicing an Eastern influenced way of life." In Kansas City Ruth pursued her own interests--singing, taking drama classes, and theater. She eventually with her husband, Chester White, attended a Religious Science Church that was open to spiritual diversity, including her own Eastern-oriented beliefs. Ruth maintained high regard for her Christian Mennonite heritage as well as for Maharaji and his ongoing ministries. Sharon graduated from Bethel College in the spring of 1970. She was engaged to marry Richard Harris, a Bethel student who had grown up in New Jersey. Sharon changed plans for a trip to Europe that summer to work in the political campaign of her brother, Jim, to be elected to the United States Congress. On October 24, ten days before the election, Sharon and Richard were married at a ceremony in the "Juhnke grove." Esko Loewen, dean of students at Bethel College, performed the ceremony. The outdoor setting was spectacularly beautiful, with fall colors in the pasture at their peak and with the black and white Holstein cows looking on. Sharon and Richard began their married life in Topeka, Kansas, where they attended a hatha yoga class and were introduced to the Ananda Marga movement, with its disciplines of meditation, yoga and self-development. The middle name of their first child, Celeste Jinanam Harris, born October 17, 1973, means "divine wisdom" in Sanskrit. Quilting the quilt Sharon made for Celeste out of scraps from her dresses. L to R: Sharon Harris, Candace Unrau, Anna Juhnke, Carita Juhnke. June 1982. Candy (short for Candace Sue) was nine years younger than Ruth, so Ruth was already attending Moundridge High School when Candy started attending King City primary school in 1965. Bill and Meta were somewhat self-conscious that they were older than the parents of Candy's classmates at King City Grade School and Moundridge. In fact, Candy helped keep them feeling young and in touch with a younger generation. As Candy later remembered, "My days growing up on the Elyria farm include rich memories of a stay-at-home mother, who was steady and reliable, always available to meet whatever need arose. It was no problem for her to design a Rumpelstiltskin costume for me without a pattern. I could always volunteer my mother to bring treats or cookies for a school event." The King City school in Elyria closed in 1972, after Candy's sixth grade there. That was a sad event for Bill, who had attended primary school (1916-24), taught the lower grades (1933-35) and the upper grades (1946-48), and served several times on the King City school board. Last updated 10 September 2009.